I’m finally getting a few days to myself with no work to do and just being able to see my friends from home for a bit. Also got my exam results and am SO relieved that they went well so I can officially relax for the summer time. Summer for me always involves copious amounts of iced coffee, lots of courgettes from my dad’s allotment and strawberries!! The strawberry & cream pairing is an iconic summer flavour in the UK, especially around Wimbledon. I made a trio of strawberry recipes for M&S which I’m reposting here for your guys to see. 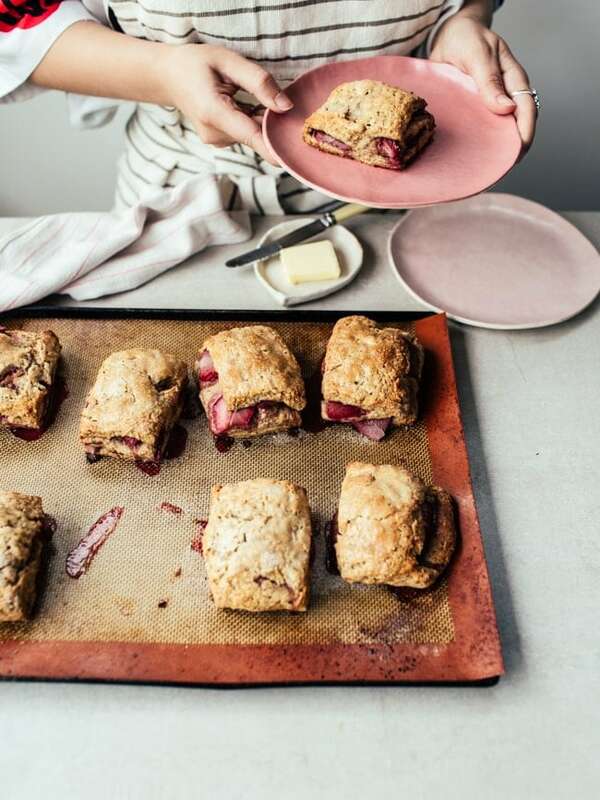 First up are these strawberry & rye scones. My favourite basic scone dough with fresh strawberries layered in. They’re best served warm with salted butter (and jam if you want more sweetness!). Preheat the oven to 180 C (350 F), line a baking tray with baking paper. Slice each strawberry into 3 or 4 slices. In a large bowl, combine the flours, baking powder, salt and sugar. Add the butter to the bowl and use your fingertips to rub the butter into the dry ingredients until it’s mostly fine-textured with some pea-sized lumps of butter remaining. Make a well in the middle of the ingredients and crack in the eggs and add the yogurt. Stir together just until you’ve mixed in most of the flour but there are still floury patches remaining. This is a very moist, soft dough!! (See pics above for this step!) Dust a clean work surface well with flour and tip the contents of the bowl out onto it. Dust the top of the dough with more flour and roll it out into a rectangle roughly 40 x 20 cm (you should really be able to pat the dough out with your hands given how soft it is, in fact!). Lay half of the sliced strawberries down the middle third of the dough. Fold the left third of the dough over the top of the strawberries to cover them. 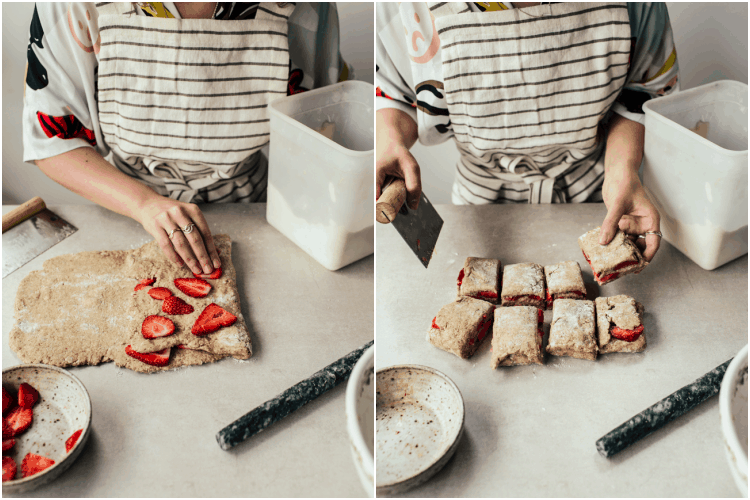 Lay the rest of the strawberries onto the flap of dough you just folded over. 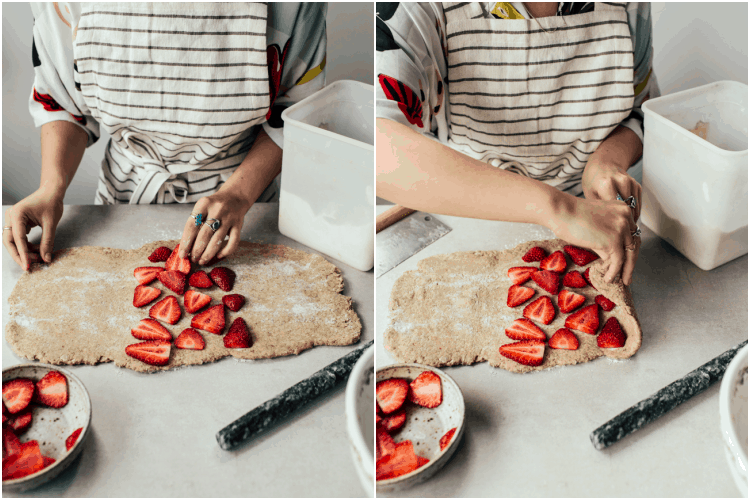 Fold the right third of the dough over these strawberries to cover them. You should end up with alternating layers going: dough, strawberries, dough, strawberries, dough. Cut into 8 equal rectangles using a large knife or bench scraper. Spread them out over the baking paper so they aren’t touching. Brush the tops of the dough with a little yogurt and sprinkle with the extra sugar. Bake for 20-25 minutes until dark golden. Serve warm. I’ve never seen scones folded the way you do on the pictures. 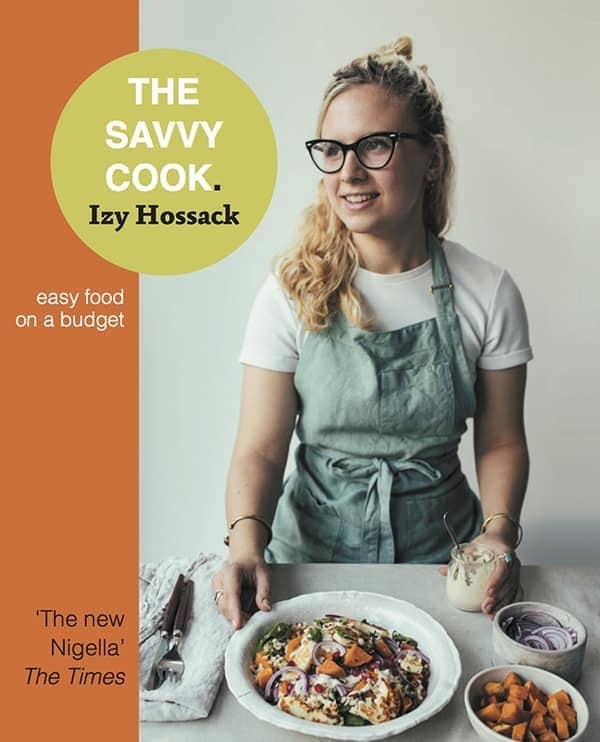 And this is one of the very few recipes which actually sounds more like breakfast to me than cake. Will save this for later, thanks. Such a lovely way to make them – love the fold! It’s funny what you say about the tennis players, here in Israel we’re so used to 30 degrees, and actually happy when it rains, and strawberries are in season in the winter, only until the end of May. so- can I make these with fresh cherries instead? or with another berry? Haha I can imagine it being a relief when it actually rains if it’s that hot all the time! I don’t think I would be able to cope. And yes I think cherries would be delicious in this 🙂 thank you! Izy these are so fun! 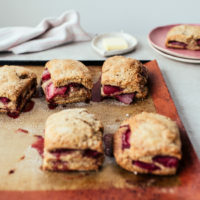 I love how these are like scone + fruit sandwiches + they’re soooo puffy and gorgeous. Definitely bookmarking while strawberries are still in season! And omg I saw some girl’s tan on instagram from being in the UK and I was like WHAT is happening over there!! Your summer heat sounds insane! Glad to hear you’re getting to relax and hang with friends though–you so deserve it!! 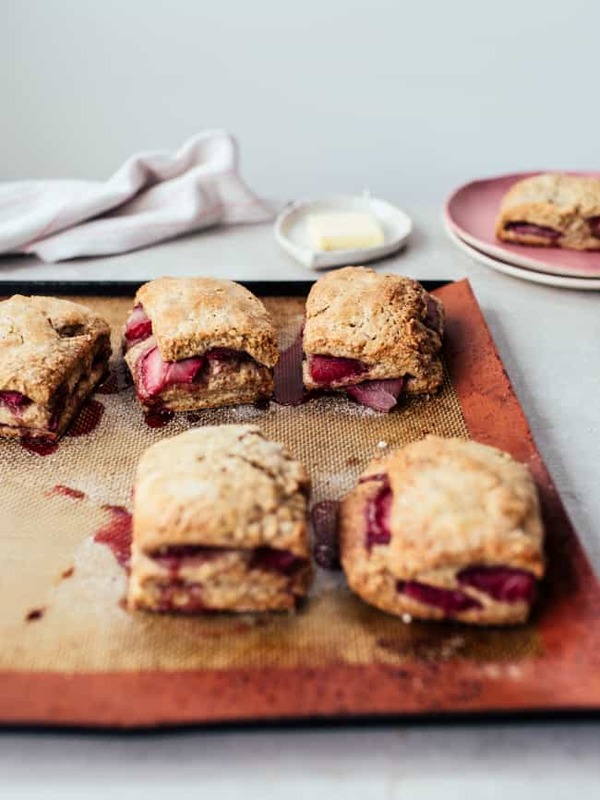 Ah– I love that trick of layering fruit into scones, it makes it look so clean and nice. And adding rye flour? Brilliant. This looks amazing! Never tried scones with rye before, will try! Strawberries and cream – my favorite thing! I love how beautiful they look with the strawberries dropped in to the last folding. I may even have to throw some mini chocolate chips in there . . . I have just made these scones. They have turned out fine, but my dough was very sticky. I did weigh and measure things carefully. Any ideas as to what I may have done wrong? Thanks. I will certainly try them again, they taste delicious. Hi, I made these but the dough was so sticky that was impossible to roll so I had to add extra flour, it was still sticky so when I folded it over it broke a bit, they came out softer than normal scones (which I don’t mind at all) but any reasons why my dough was so sticky? Hi Serenella, this is a very soft dough as it’s an American-style scone (which is a wetter mixture) than traditional British scones. If you were using cups rather than grams it could also contribute to a wetter dough due to measurement discrepancies. Lastly, egg size could make a difference. I always use medium eggs in the UK (which equate to large eggs in the US but I’m not sure about elsewhere in the world what the grading system is like). I plan on making these. Just wondering, why rye flour??? Just adds a nice bit of extra toasty flavour!